An unprecedented and long-running dispute involving a herd of pigs and a low-flying hot air balloon has now settled, with the help of expert testimony from a professor of Mathematics at the University of York. Back in 2012, a herd of pigs owned by Ian Mosey (Livestock) Limited of Gilling East, North Yorkshire, was disturbed by a low-flying balloon coming within several hundred metres of the animals, and firing its burners. The pigs stampeded to a corner of the field, injuring each other as they went. As well as a boar dying from its injuries the next day, the pregnant sows suffered a number of aborted piglets and stillbirths. One issue in the dispute related to the exact location of the balloon in relation to the animals – the insurers for the company providing the balloon ride used GPS data generated during the flight to claim that the balloon didn’t come closer than 750 metres from the pigs, and so could not have caused the stampede. Representing Ian Mosey (Livestock), Darren Morgan of Langleys Solicitors in York, disputed this claim, having obtained both eyewitness and photographic evidence that the balloon was in fact considerably closer and therefore liable for the ensuing loss of livestock. Mr Morgan realised that using the balloon’s dimensions, and other information such as the height of the trees in the photograph and the distance between the trees and the photographer, the exact position of the balloon could be calculated. He contacted Professor Chris Fewster from the Department of Mathematics at the University of York, who subsequently concluded that the balloon was between 750 and 760 metres from the photographer when the photo was taken. As the pigs were around 560m closer to the balloon flight path than the photographer, Professor Fewster’s report put the balloon at around 300m from the pigs when it fired its burner – significantly closer than the balloon company’s insurers were arguing. Following Professor Fewster’s report, and having made an initial offer of £10,000, the balloon company’s insurers have now agreed a settlement of £38,782. 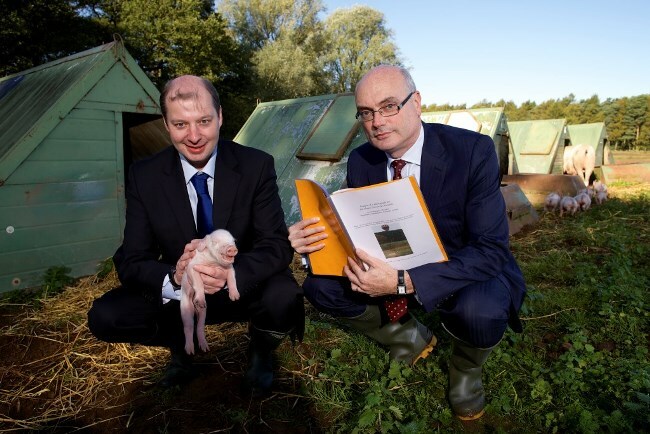 Commenting on the case and its eventual conclusion, Mr Morgan, dispute resolution partner at Langleys Solicitors, said: “This was a particularly interesting case because the exact position of the hot air balloon in relation to the herd of pigs would have been almost impossible to prove without both the initial photographic evidence, and the subsequent calculations from Prof Fewster. Prof Fewster said: “The wonderful thing about mathematics is that it helps us think clearly about the world. The hot air balloon company in the case was Cameron Flights Southern Limited which went into liquidation in April 2013.